There was a time we were one nation, under God, indivisible, with liberty and justice for all. Perhaps one time that was the case was the 1950s. While it is true that we had a lot of problems, with unaddressed sexism and racism rampant, it was a period of relative peace and prosperity, a period of growing security for most Americans, and a period of relative income equality. Union strength was high, and economic growth was broadly shared. Consider the chart above. From the end of World War II until the mid-1970s, our nation’s economic growth was widely shared. 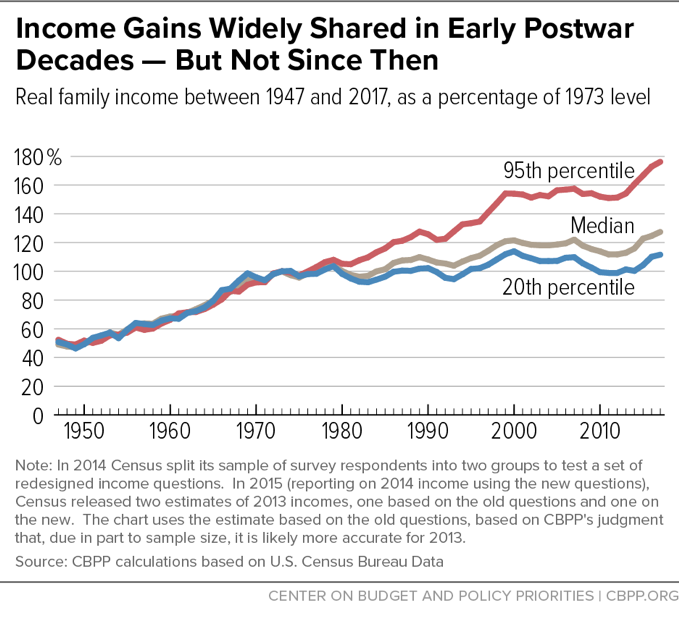 Indeed, you can see that through the late 1960s, incomes for the bottom 20th percentile of families increased faster than for the rest of the workforce. That all changed starting in 1973. As the chart illustrates, the 95th percentile and above now earn almost 180% of the income they earned in 1973, while families at the median earn 120% of the 1973 level, and families in the bottom fifth earn just over what they earned in 1973. What is missing from that chart, however, are the changes in income of the top 1%, and the top 0.1%. Those changes would be even more dramatic than the for the rest of the population. During that period, by the way, U.S. gross domestic product (GDP) per capita (per person) increased by 213%. If incomes for the median family only increased by 120%, where did the rest of that wealth go? This chart gives us additional depth to understand what’s going on. 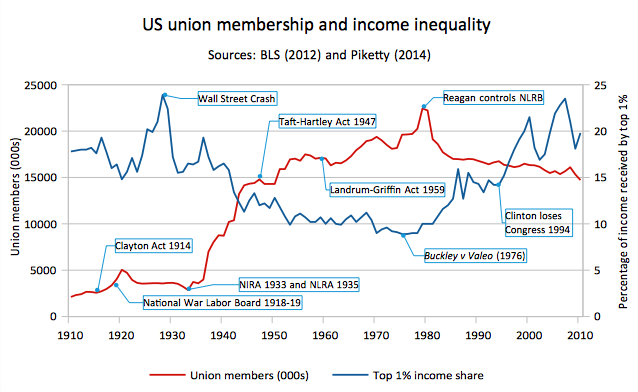 First off, you can easily see the relationship between declining union membership and increasing inequality. Both charts show that the real increases in inequality happened starting about 1980, when Reagan came into office. Not surprisingly, his election was the high water mark for union membership. He started the Republicans’ relentless attacks on labor that have continued unabated. To give the Republicans credit, their attacks on labor have been extremely successful. The drop in union membership is even more dramatic when you consider that in the period from 1980 to 2012, the U.S. labor force increased from 106 million people to over 154 million. In other words, while the total number of union members declined slightly, the total labor force increased in size by nearly 50%. The result is a dramatic decrease in the percentage of the total labor force represented by unions since 1980. Unions are not perfect. However, as a voice advocating for more income going to the workers as opposed to the top managers and shareholders, unions do not have an equal. Certainly, there is currently no other voice working to increase income equality, and the result is, as we can see from the charts, predictable. The graph above is particularly telling because it illustrates a couple of other relevant points. For example, it shows how the period from the end of the Second World War until the early 1980s was a unique period, characterized by low income inequality, a problem that reached its peak at the beginning of the Great Depression, went down, and then reached comparable levels today. Furthermore, the chart shows the relationship between policy and its impact upon the economy. For example, look at the rapid increase in union membership following the passage of the National Labor Relations Act (NLRA). On the other hand, look at the precipitous decline in union membership starting when Reagan took control of the National Labor Relations Board (NLRB). And finally, look at how income inequality started to rise almost immediately after the Supreme Court handed down the Buckley v. Valeo decision in 1976, the first decision restricting government’s ability to regulate political spending since, according to the Court, money is the equivalent of speech. It will be interesting to look back on a similar chart detailing the changes since the Citizens’ United decision took that law to a new level. So from an economic standpoint, the period from the end of World War II until the early 1970s was unique. By the same token, it would be hard to characterize the United States as being on one page in the 1960s. Economically, we may have enjoyed relative fairness. But in the 1960s, with Vietnam raging and the civil rights movement catching fire, our social fabric was coming apart. 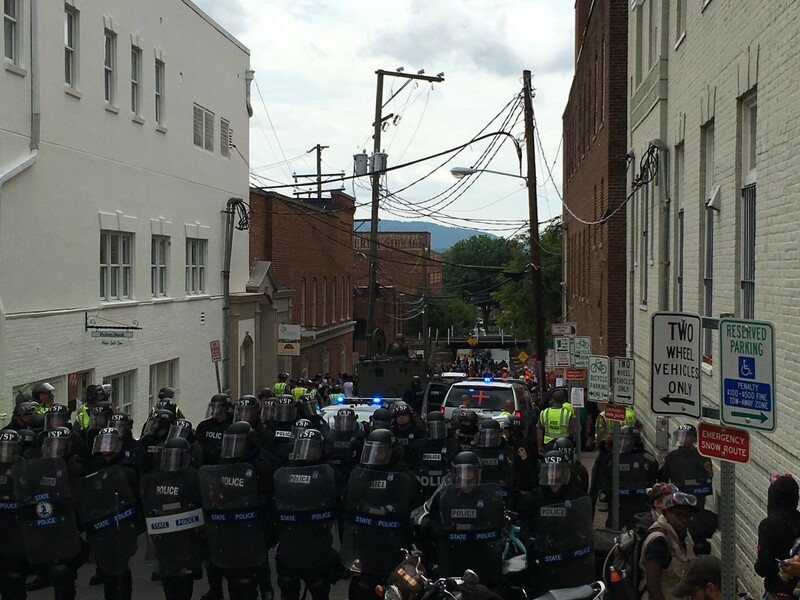 Historians Maurice Isserman and Michael Kazin, experts on the period, have characterized the time as a civil war. Admitting then, that we look at the 1950s through decidedly rose colored glasses, objectively there was something special about that period. It was a period characterized by overall social cohesion, GDP growth, and relative economic fairness. Companies did feel a sense of responsibility to their employees, and where they didn’t, unions were able to force them to take the employees needs into consideration. The result was a broad political consensus. In other words, it was everything today’s era is not. So what made the 1950s special? I would argue the biggest difference has to do with the fact that we had just worked together to prevail in one of the biggest challenges of our history. It is estimated that about a quarter of all American men served in the military. It was not uncommon in the 1950s for people to ask each other upon meeting where they served. It was an experience shared by everyone of a certain age. In the military, Americans of all levels of education, wealth, and from all parts of the country served shoulder-to-shoulder. With that experience, no matter what your background, you would have ingrained a sense of community, of being a part of a common American enterprise. What’s more is that after the war ended, with the GI bill, we experienced the biggest increase in education in our country’s history. It moved an entire generation of working class Americans to the educated middle class. Its value to our economy has been nearly incalculable. So how do we duplicate the best of what existed in the 1950s? I would argue that we need a new national shared experience among young people that requires people of different backgrounds to work together. Obviously, we don’t want to fight another war. But perhaps a service requirement, mandating that all young Americans either serve in the military or work in some type of civilian service program, would be the type of program that could help rebuild the sense of commonality that is now missing from our society. In return, we should guarantee a free college education. Think of the potential benefits. The very rich would no longer be able to isolate themselves from other Americans. People of different classes, races, and education levels would learn to see each other as individuals. We would address the high cost of higher education while giving skeptics a sense that the country was getting something in return. Finally, it would ensure that students would be more mature, having sowed their wild oats in a regimented environment rather than expensively flunking out of college. Certainly, we don’t want to return to the sexism and racism of the 1950s. But if we could duplicate the sense of common enterprise that World War II veterans shared, as well as once again offering the benefits of affordable college education, we might actually be able to revive some of the benefits of that unique period in our history. Should we stop worrying about inflation?